A friend of mine recently referred to me someone who was looking at planning a trip to Costa Rica. In true wanderluster fashion, I seized the opportunity to hijack his vacation and completely plan it for him. I’ve broken my recommendations into eight days, but this itinerary is not for the light-hearted… it really keeps you on the move and you’ll end up driving for at least 15 hours. If you don’t enjoy driving and sightseeing, you may want to go to one or two of these places and just park yourself. As always, if you have any ideas or questions, please comment. Here’s the link to the Google Maps loop. Most flights from the US to Costa Rica (SJO) arrive late at night, so it’s nice to plan that first night in Alajuela ahead of time. I recommend these hotels right near the airport. Hotel Pacande: This is a no-frills, inexpensive hotel/B&B that is a $5 taxi ride from the hotel, and/or offers parking if you get your rental car that night. Margarita’s Airport Hotel is a little nicer option that’s only about 10 minutes from the airport. You may or may not need a 4×4 rental car. If its the rainy season, or if you plan on being adventuresome at all, I would recommend it. Start early to beat the traffic through San Jose. Head east, then south on Highway 2 towards San Isidro del General. You’re guaranteed to get lost, but that’s part of the fun. Stop wherever anything looks interesting, and enjoy the drive because it’s taking you through some beautiful country. Costa Rica is a lush and vivacious place were plant and animal life abound. Once you get to San Isidro, take the 243 over the pass towards Baru. Just over the peak, you’re going to find yourself at El Mirador Restaurant. All other restaurants in Costa Rica and on planet earth pale in comparison. 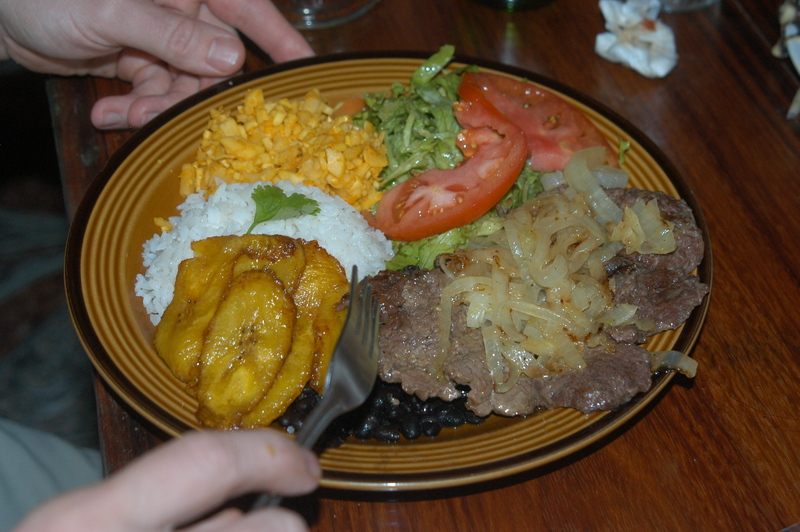 I recommend the Casado (the typical Costa Rican meal consisting of Gallo Pinto (rice and black beans), meat (generally pork or beef), and sweet fried plantain (proof that God loves us). El Mirador does it up right and the view leaves nothing to be desired. If your trip stopped here, it would already be a success, but you’re just getting started. Once you’ve had your fill, find your way down the mountain and get a place to stay in the idyllic surfer town of Dominical. Work up your appetite again by renting a surfboard and giving it a shot. The waves are big enough to give you a fighting chance, but not so big that they will crush you. Enjoy the sunset with a beachfront meal at one of the many popular restaurants in Dominical. Along the road from Platanillo to Baru, you may have seen a little store with a sign for Nauyaca waterfall. That’s your objective this morning. Skip the horseback tour unless you’re crazy about horses and/or you enjoy the feeling of helplessness as your horse slips and slides on the muddy trail. For $2 or $3 you can just hike. Nauyaca is a powerful waterfall with inviting, crystal clear water. When you descend into it, you’ll notice that the entire canyon is filled with mist – not the best place for cameras, but an amazing place for memories. Bathe in its waters and refresh yourself. You should be back by about noon, and if you’re as obsessed as I am, maybe you’ll want to run back up to El Mirador. Either way, save some time because you’re about to visit the most amazing beach in Costa Rica – Playa Ventanas. You’ll find it just a little further south of Dominical – past Uvita and Pinuelas (which, incidentally, is a great beach if you have kids because hermit crabs abound). Playa Ventanas, though, combines a secluded cove with a palm-tree canopy, and a big rock outcropping which is pierced by two tunnels which beg you to enter. Hearing the waves crash in the echo chamber of these tunnels is eerie and serene at the same time. You’ll never forget Playa Ventanas. Before nightfall, you’ll need to head North to Manuel Antonio. Stay in any of the many bed and breakfasts near the park, and skip Quepos, which, while an interesting port town, has some drawbacks. Start your day with a visit to Manuel Antonio National Park. If you don’t see white-faced Capuchin monkeys here, then you’re just plain unlucky. When we visited in 2006, I had a showdown with one of these bad boys right in the middle of the trail. You might even find the elusive squirrel monkeys. Manuel Antonio, while uber-touristy, is a must-see because it combines great hiking trails, beautiful beaches, and an abundance of wildlife. Continue northwest along the 34 and maybe stop in and take a peek at Playa Hermosa. Whatever you do, don’t miss a stop on the bridge over the Rio Tarcoles where you’re guaranteed a chance to see the most enormous crocodiles you may ever see. I’ve heard legends about tourists tossing live chickens off the bridge, but I will neither confirm nor deny whether I know anyone who’s actually done it. Leave yourself some time, though, because you’ve still got a four hour drive to Samara. Once you get to Samara, pick out a nice hotel because you’ll finally sleep in the same bed for two nights. Samara completely spoiled me. All other oceanic experiences will never compare with what happened to us there. We were lazing on the beach, chatting with the owner of a surfshop. The thought occured to me to ask him if he knew of anyone who could take us out into the ocean in hopes of finding a pod of dolphins. It wasn’t an hour later that we arranged for a friend of his to take us out in a tiny little boat. The friendly captain set a course for the deep water and we enjoyed the scenery while the swales of the ocean engulfed us. Almost an hour later, our captain pointed out some splashes in the distance. Before long we found ourselves right in the middle of dozens of dolphins, jumping alongside the boat. The boat came to a halt and we threw on some snorkeling gear and joined in the fun. There were dolphins under us, alongside us, and all around us. We could hear them and just reveled in the experience. On the way back, we hand-fished and caught a beautiful Dorado (which we later had cooked up for us for dinner). If that weren’t enough, our captain also swung us by reef where we also did a little snorkeling. It was absolutely surreal and unfortunately not something easily re-created. Even if your experience doesn’t reach that level of amazingness, Samara is straight-dreamy. It’s a chill-enough town that you might have the beach all to yourself if you make a late-night stroll. And if you get to where you’ve had enough, you could always jump over and check out Nosara. Sleep in and enjoy a lazy morning in Samara. We found a nice little pastry shop for breakfast and took it easy. Once your ready to get on the road again, keep your eyes peeled for monkeys in the trees as you drive. We found a troop of spider monkeys in a tree off the road between Samara and Nicoya. After you cross back over the International Friendship Bridge (A gift from Taiwan), you’ll be headed inland into the mountains again. Take the Inter-American Highway north to Canas and then turn off towards Arenal on 142. This road will take you along lake Arenal at the base of the most majestic active volcano I’ve ever seen. You’ll arrive late so you probably won’t be able to see the top. (You’re best chance is early in the morning before it starts to cloud up). You could stay in La Fortuna, but I’m going to recommend that you spring for something closer to the Volcano. You’ll also be here for 2 nights, so keep that in mind. Tonight you’ll visit Tabacon – the magnificent hotsprings at the foot of Arenal. If you really want to splurge, you can stay right there… I doubt you’d regret it. As it gets dark, keep a lookout for lava spilling down the mountain. You’re not close enough for it to be scary, but seeing it is quite the experience. You’ll also be able to feel and hear the mountain grumble. Your first objective today is another hike to a serene waterfall. La Fortuna Waterfall is just outside the town of La Fortuna, and while its a more commercialized spot than Nauyaca, I can assure you that it will be unlike anything you’ve seen before. Once you’ve partaken of La Fortuna and scaled your way back up the stairs, you can map out your next few stops. Your drive today will take you up over another mountain pass and through some really amazing towns. The first stop will be Zarcero, where some uniquely trimmed bushes combined with some high-mountain fog combine to create a mystical feeling as you tour the town’s central park. There will be plenty of photo-ops and more great memories. Continue south on the 703 and turn off towards Sarchi before you get back to the Inter-American Highway. Sarchi is a great place to load up on wooden knick-knacks and genuine Costa Rica souvenirs. Not only is the selection great, but the prices are reasonable as well. You’ll stay the night in Grecia… a small town with an interesting church and not much more. If you’d like, you could also head back into Alajuela, which isn’t too far away. Make your way directly to La Paz Waterfall Gardens, a veritable paradise within a paradise. The place has an aviary that is so much more incredible than any other I’ve seen. We had toucans trying to get into our backpack. If that weren’t enough, the hummingbird haven and the butterfly garden will inspire you. Once you’re done with those, you can scour the reptile area for red-eyed tree frogs or see the jungle cats in their natural habitat. And of course there’s a reason it’s called the Waterfall Gardens… more than a couple beautiful waterfalls are also on the premises. You could easily spend the entire day here. After your senses are raw with amazement, you can head back down to Alajuela where you’ll stay where you started (if you liked it). Be on the lookout for roadside vendors selling enormous strawberries. Don’t pass them up. You could stop in at the market downtown or even go into downtown San Jose if you’re into bigger cities. Unfortunately it all comes to an end today. You’ve made memories that you will cherish for a lifetime and hopefully you’re closer to your spouse or travel mate. This won’t be the last time you visit Costa Rica. You haven’t even seen the half of it. I’ve wanted to stop in on the Boruca indigenous tribe twice now and never made it happen. To pull this off, you’d need to make a deeper loop down south to begin and add at least one night. You could opt to take the ferry from Puntarenas en route from Manuel Antonio to Samara and swing by Montezuma or Malpais (both places I’ve heard absolute ravings about). A Canadian couple once told me that they watched somewhere in the neighborhood of 100-150 monkeys partying in a tree outside Montezuma. Between Samara and Arenal, you could also route your trip to make a stop in the Monteverde cloud forest area. Here you can see some old-growth rain forest that will just completely paralyze you. We saw enormous, 1000 year-old Mahogany trees and climbed up through the hollows of strangler figs. Monteverde is a wonderland. The first time we went, we booked a 1 night, 2 day tour with Jungle Tom Safaris from San Jose out to Tortuguero, which is only accessible by a boat through the canals on the Caribbean side. We saw (and heard) howler monkeys and turtles, laid out on a black-sand beach, and toured a banana plantation. Once again, I can’t rave enough about Costa Rica. As I write, I am overcome with a wanderlust that could be criminal. My only hope is that you’ll go and send me your pictures and tell me your stories. Thank you for wanderlusting with us. Keep coming back and tell your friends. Life is too short not to wander. If you’re still trying to figure out how to pay for your flights to Costa Rica, get yourself some frequent flier miles. Check out our FF Mile Cards page to see what’s out there at the moment. This entry was posted in Eight Great, Fun Travel Stories and tagged Costa Rica Itinerary, Costa Rica things to do, Dominical, Manuel Antonio National Park, Samara Costa Rica. Bookmark the permalink. John- Ok man, there she is, the beast in all of her glory. I successfully hijacked your vacation. You’ll be fine without speaking Spanish. I have a buddy who’s fluent and doesn’t even speak it when he goes down there. There are times it would be handy, but you’ll be find. I’d urge you to do the ferry thing and check out Malpais/Montezuma. Get a 4×4 just in case the roads are bad. Send me pics because I really want to get out to that area. You can snorkel in CR, but it’s not the greatest place. There are some great places to surf, and Domincal and Samara are great for that. Let me know what other thoughts you have and keep wanderlusting with us Thanks for your interest! How did you find us, by the way? Those legends of chicken tossing can’t be true, PETA would be all over them! Brad, quite the amazing review on Costa Rica. You did a great job showing what activities to do and things to see along the way. Remember that the CDW is mandatory on the car rental too. Thanks for the info. Man, thanks for your time in putting this all together, you did a great job. Now if I can just get there to put it to use. Thank you so much. This looks awesome. We will probably make a 10 day out of this and head over to Malpais/Montezuma as well. I’ve never been snorkeling, so I imagine even if CR isn’t the best place, it will look pretty nice for a first time. My wife and I are newcomers to the world of mile/point collecting, but we’ve had a good start in the first 5 months, and are really looking forward to seeing the world together. I’ve been following your blog for a few months now though I don’t recall how I found it. Probably linked from MillionMile, Mommy, TPG, or Flyertalk. Thank you for sharing your travels and tips with us. Please keep it up. Did you make it to Costa Rica? Do you have any stories or pictures to share? Frank, What a bummer that you had a disappointing experience. There are definite parts to avoid, and it is tough to know which places are going to be the best for you. Costa has some much more beautiful beaches than Manuel Antonio, they’re just low key, which is exactly what you want. Let us know if you ever plan on going back and we could have some other ideas for you.